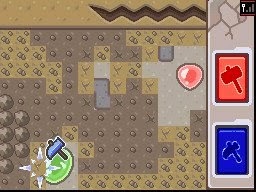 Gems are used in place of coins/rupees in this game. this was inspired by the colorful gems in Friendship is Magic. It seems to be a colorful alternative to regular bits/coins and by using different sizes I can give each a unique value. I can measure the currency in weight instead of having a separate wallet for each. There's Topaz (1g), Beryl (5g), Garnet (20g), Sphene (35g), and Kunzite (50g). Details on how they work below the break. Currency in Adventures in Equica has a neat twist to it in that some shops may prefer one type over the other. I'm going to have it so the player can discard unwanted gems and turn off the ability to pick up unwanted ones. The total weight (measured in "g" for "generic units") is the weight of each gem type added up. You can't collect a gem if it will exceed your wallet's weight limit. To tie this together even better, I have it so that pixies eat gems. Parax even jokes about how pixie dust is actually pretty gross. This kind of gives them a story purpose. Pixies allow ponies to use them as instant transport in exchange for gems. Player gems are discarded by feeding Parax. Whether or not I decide to have gems randomly hidden in walls retrieved through a minigame or by checking a wall sparkle depends on how much time I have towards the end of production. Having something like the Underground dig game to add variety was what made me so sure about doing gems in the first place. It's something extra and different that will make random currency more interesting.